It comes in a blue box with a microUSB cable for PC connection – USB, charger, headphones with 3.5 mm Jack. They have choosen the same jack for charger as previous phones. It is a stylish phone with loads of metal – the smartphone edges and the battery cover. It gives the impression of solidity and construction quality. They chose to round more strongly the edges of E6 unlike the E72. They refined the winning recipe several years ago. The qwerty keyboard seems to be taken in full from E72. On the basis of the touchscreen display of 2.46 inches with the resolution of 640×480 pixels, – a TFT capacitive – are a series of capacitive buttons that will confuse you. – Right – buttons for volume control and voice command, one for quick unlocking and locking the touch screen. 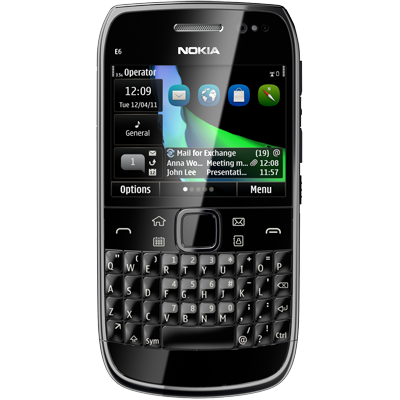 Nokia E6 has a touch display but also a QWERTY keyboard. A similar model is HTC Chacha, indicating that Chacha has another younger audience while E6 relies on the business. Now is a real race for bigger screens on smartphones and here I refer to the full touch. 2.46 inch may be enough for browsing and applications. Sound comes from the back side next to the 8 Megapixel camera sensor. This smartphone is loud, but clear. The 3.5 mm jack headphones which are coming from the factory are decent. Qwerty keyboard comes to be used with great pleasure after a short accommodation period. Classic for Nokia – 680 MHz processor, 256 MB RAM, 1 GB ROM, 8 GB of storage space and microSD up to 32GB. Now they picked on the new phones with Symbian Belle to implement a processor clocked at 1 GHz. Important is not necessarily the hardware, it is the way of working with the operating system tasks such as browsing, downloading and running applications. Runs Symbian Anna and maybe the future will make the transition to Symbian Belle that already can be found on models of Nokia smartphones as 701. Icons are more rounded. You can customize four home screens with applications, widgets or shortcuts. Do well in loading web pages. 3G module seems detached from the Nokia E72. It has the new Bluetooth generation, Wi-Fi b / g / n, microUSB, 3.5 mm jack. One with Carl Zeiss optics would have gone perfectly, but they chose the 8 megapixel fixed-focus sensor which records HD at 25 fps. Photos are made ​​quickly and their quality is decent.